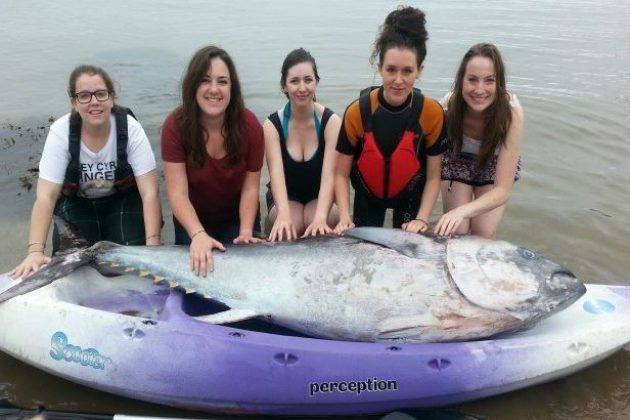 Five friends on a kayaking trip - Charlotte Chambers, Shauna Creamer, Hannah Ford, Sarah Little and Laura Pickervance found this massive rare fish worth £1million – but they’re unlikely to see a penny. The 136kg (300lbs) bluefin tuna, measuring 2.17m (7ft 1in), was discovered floating in the water at the village of Kingsand, in southeast Cornwall, UK. The fish are very rare in British waters where it is illegal to catch them, but experts say the fish is worth at least £1,000,000. Last year a 4ft 6ins long barrel-shaped fish was found floundering off Torquay – around half the size – and was valued at £500,000. But sadly for the girls the 300lb fish was taken by officials from the Marine Management Organisation, part of the Department for Environment, Food and Rural Affairs. Claire Wallerstein, a volunteer strandings recorder for the Cornwall Wildlife Trust, said she "just could not believe it" when she saw the fish, which took six men to lift. "Someone came to my house to tell me there was a dead dolphin on the beach. "They were coming out of the sea with this huge monster, but then I could see it was a tuna." Bluefin tuna is found in the Pacific Ocean and the Indian Ocean, with smaller quantities fished from the Atlantic Ocean and Mediterranean. Bluefin numbers began to decline in the 1960s with the introduction of new fishing methods, with over-fishing leading to its critically endangered status. The biggest market for the fish is Japan, where people eat it raw in sushi. Prices can be high for such tuna because of its rarity. In 2013, a 222kg (489lb) bluefin tuna was bought at an auction for £1.05m by a sushi restaurant owner in Japan.